H2O: as the most abundant molecule on earth, this simple yet unique substance exhibits remarkable properties that make it irreplaceable. It is the universal solvent, the major component of the human body, the molecule that sustains life on our planet. And now, with the development of three water-based methods for electricity generation, it may become the newest form of green energy. Renewable and emission-free, water provides an appealing alternative to fossil fuels. Learning to harness its power-generating potential could help reduce mankind’s carbon footprint and limit global warming. Moreover, water covers 71% of the Earth’s surface, making it cheap and readily accessible. 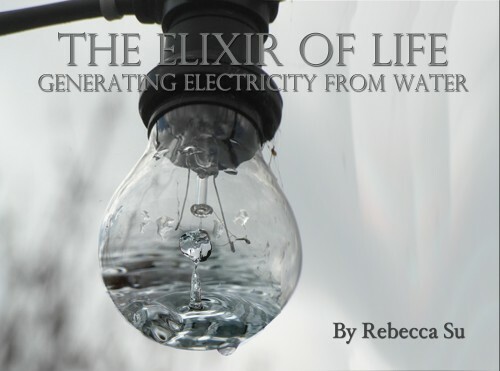 Obtaining electricity from water could significantly alleviate the global energy crisis. Menachem Elimelech, professor of chemical and environmental engineering at Yale, studies pressure-retarded osmosis and other membrane-based methods for electricity generation. Courtesy of Yale University. So far, Elimelech and his collaborators have developed two techniques to harness energy from water: pressure-retarded osmosis (PRO) and reverse electrodialysis (RED). 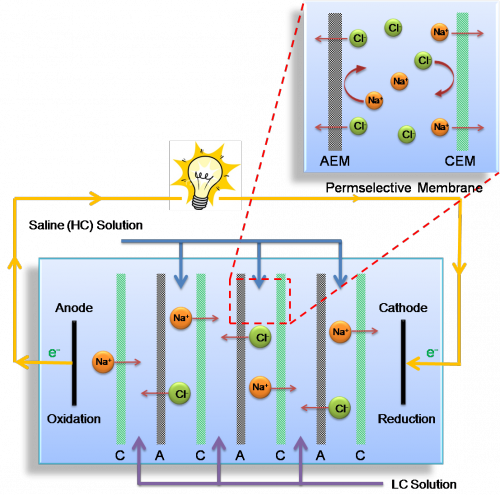 Another water-based technology, microbial fuel-cells (MFC), uses a different principle to generate electricity from wastewater. A schematic of PRO. When the dilute and concentrated solutions mix, they generate osmotic pressure that spins a turbine to produce electricity. Courtesy of Menachem Elimelech. From the earliest water wheels in ancient Greece to modern-day hydroelectric dams, humans have historically relied on the motion of water to produce energy. Pressure-retarded osmosis relies on a similar principle, generating electricity through the diffusion of water across a membrane. Osmosis occurs when a water-permeable membrane separates two solutions of unequal salinity, and the pure water diffuses from the less concentrated to the more concentrated region. The energy of this motion can be captured and converted to electricity. PRO exploits the concentration difference between two water sources: one with a high salinity (generally seawater) and another more dilute freshwater source (river, brackish, or waste water). The two types of water are placed in adjacent chambers separated by a special membrane. Due to the resulting concentration gradient, water diffuses across the membrane from the freshwater chamber to the seawater chamber. The buildup of water volume in the more concentrated region creates pressure that spins a turbine, generating electricity. Meanwhile, a second channel recycles the freshwater by returning it to its original chamber. The major challenge in producing low-cost energy with PRO lies in designing an appropriate semi-permeable membrane. The material must allow water to diffuse freely across it but simultaneously block the passage of salts and other dissolved substances. These ideal conditions are difficult to attain: small amounts of salt from the concentrated chamber are able to pass through the membrane into the dilute chamber, and water from the dilute stream may flow into the concentrated stream as well. The net effect of these factors is to increase the salt concentration of the dilute stream and reduce the overall driving force for osmosis, a phenomenon known as internal concentration polarization. A schematic of RED. As anions and cations flow in opposite directions through selectively-permeable membranes, they generate electricity. Courtesy of Menachem Elimelech. Unlike PRO, which relies on water transport, reverse electrodialysis captures energy from the movement of ions. Ions, charged particles formed when a salt dissolves in water, are abundant in seawater. When seawater mixes with freshwater, ions naturally diffuse into the less concentrated freshwater to create energy. Just as the name implies, this is the opposite of electrodialysis, which uses energy to force ions against their concentration gradient. RED uses two types of semi-permeable membranes: anion-exchange membranes, which only allow the passage of negatively-charged ions, and cation-exchange membranes, which only allow the passage of positively-charged ions. The RED system is set up with alternating salt water and fresh water channels separated by membranes. Each salt water channel lies between two fresh water channels, bounded by an anion-exchange membrane on one side and a cation-exchange membrane on the other. A typical RED apparatus consists of many stacks of these alternating membrane pairs. As salt water and fresh water mix, anions and cations diffuse in opposite directions toward two electrodes on either end of RED apparatus. Electrodes receive the ions and convert this energy into an electrical current carried by a connecting wire. Research has revealed that the maximum amount of energy that RED can theoretically produce depends on the salinity, or salt concentration, of the water source. Whereas typical seawater can produce just under 1 kilowatt-hours of energy, highly concentrated salt water sources like the Dead Sea can generate over 14 times that amount. To optimize power density, researchers are also working to redesign spacers, structures that provide mechanical support between membranes. Conventional spacers interfere with ion transport, but newly-developed conductive spacers are permeable to ion flow. A major challenge to implementing widespread RED systems is the cost of the ion-exchange membranes, but researchers hope that prices will go down as global demand increases. Better production technologies and more efficient membranes will also contribute to a lower cost. Elimelech suggests that the energy created by PRO and RED could be reused to desalinate water, creating a closed-loop system. Courtesy of Menachem Elimelech. Thanks to the advent of new technologies, modern methods of acquiring energy have become remarkably diverse. In addition to the water from oceans and rivers, scientists have found that wastewater can be a valuable resource. In particular, this energy can be converted into electricity-using bacteria. Since current wastewater treatment plants already use bacteria to remove organic material from the water, microbial-fuel cell (MFC) technology can transform these treatment plants into the power plants of the future. MFC relies on the natural metabolic processes of living bacteria; virtually any type of organic matter can be consumed and converted into electricity, including algae and cellulose products from plants. A typical microbial fuel cell consists of two compartments, each containing an electrode. In one chamber, bacteria consume organic material in the wastewater and release electrons. These electrons are transferred from the anode to the cathode through a connecting wire, which creates an electrical current. In the other compartment, the electrons combine with protons and oxygen to create water as a byproduct. Due to lower power densities and the high cost of cathodes made from precious metals, current MFC models are not yet viable for commercial-scale energy production. In the meantime, they may reduce the power consumption of wastewater treatment plants. The world’s first osmotic power plant was opened in Norway by the state-owned energy company Statkraft. Courtesy of Statkraft. By using the salinity gradients between fresh water and seawater, PRO and RED can take advantage of numerous water resources worldwide. Any site at which oceans and rivers meet is a theoretical energy supply: in fact, the energy stored by the concentration gradient between sea water and fresh water is as much as 0.8 kilowatts per cubic meter — equivalent to the energy produced by water falling over a 280 meter high dam (by comparison, the largest dam in the world is only 185 meters high). According to Elimelech, not all of this is extractable due to technical issues in the energy conversion process, but water technologies can still contribute to alternative energy sources. Current efforts focus on making water technology viable for large-scale energy production. Meanwhile, in the midst of ongoing research, early prototypes of water-based power plants have already been put to the test. In 2009, Norway started operating one of the world’s first osmotic power plants, which generates electricity using PRO. 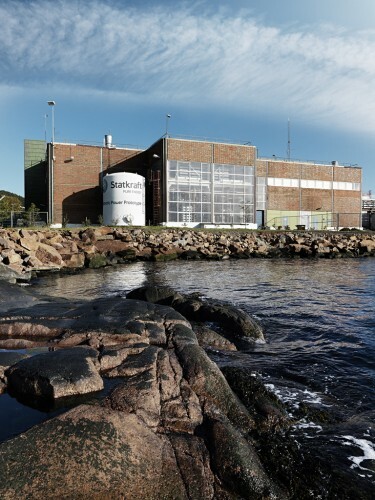 Located in the Oslo Fjord, the plant could generate enough to power a coffee-maker, around one watt per square meter. If scientists can achieve a five-fold increase in power density, a larger plant will be built in 2015. “If you have something around ten watts per square meter, which is very doable technologically, then it would be economical and compete with renewable energy,” says Elimelech. About the Author: Rebecca Su is a freshman in Silliman College studying biomedical engineering and economics. Acknowledgements: The author would like to thank Professor Elimelech for his time and devotion to his research. 1) Logan, Bruce E. and Elimelech, Menachem. Membrane-based processes for sus- tainable power generation using water. Nature 488, 313–319 (2012). 2) Ramon, Guy Z., Feinberg, Benjamin J. and Hoek, Eric M.V. Membrane-based production of salinity-gradient power. Energy & Environmental Science 4, 4423- 4434 (2011).